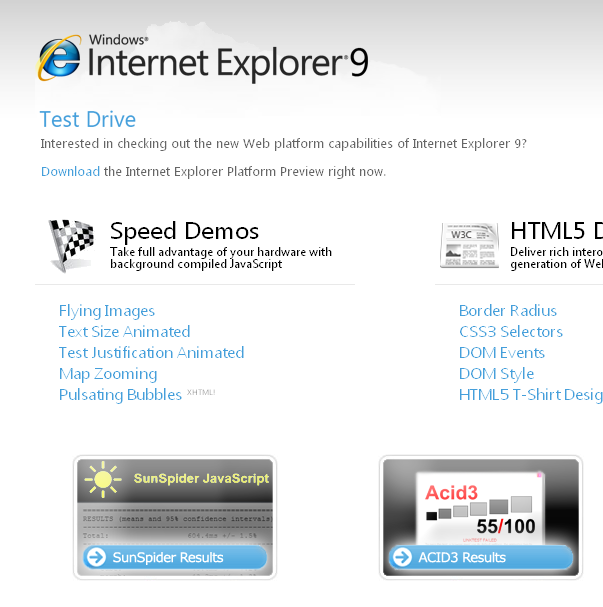 It looks like Internet Explorer 9 will have quite a few nice new features for web designers and developers! I must say I’m quite impressed, although I haven’t actually downloaded and installed the preview yet. But why can’t they just call the test version IE9 preview or something logical. Internet Explorer Platform Preview ?? Posted at 17:11. Tags: CSS. Categories: browsers, Internet Explorer, Mozilla Firefox, web design. Both comments and trackbacks are closed. Microsoft is trying to incorporate the features from different browsers into IE9. « Why the Delay, Mozilla?